Construction projects in the US are fraught with unforeseen complications and delays. We’ll be building in a third world country. Be flexible and patient. That’s what I told my trekkers a few days before 14 of them flew to Nepal with me to help rebuild Chhulemu, a tiny Sherpa village, ravaged by last spring’s earthquakes. Our project is to rebuild eight of the 30 homes in the village, so badly damaged they are unsafe to inhabit. The homeowners have been living in temporary shelters, suffering the summer monsoon season. In addition to those eight rebuilds, we will also be repairing 12 other homes. I had no idea the nature of the obstacles we would face, but a really big one presented itself even before we left. In late September Nepal adopted a new constitution for itself which contained certain provisions India (neighbor to the south) did not like. On the heels of the Constitution’s ratification, India which is “Nepal’s largest trading partner, allowed and silently supported a blockade of goods flowing across the countries’ common border. All this is happening only six months following the devastating earthquakes that rocked the country. In my opinion India’s actions are nothing less than barbaric and cruel, resulting in needless suffering of the already beaten down Nepalese. International pressure from the United Nations could end this crisis, which sees no end in sight. If you feel moved to take action, please send an email to our UN ambassador, Samantha Power, at https://www.whitehouse.gov/contact/submit-questions-and-comments. At the top of the body of your post please say “To the attention of Samantha Power”. Thank you. Without HDF’s knowledge two men filled the tank of a truck with black market purchased fuel and drove it to a remote border crossing. There they met another truck from India loaded with cement and rebar. The transfer of money for goods was made and the Nepali team delivered the materials to the Chhulemu site. Black market prices for both the fuel and materials resulted in a cost increase of 33.3%. Correspondingly, the money we advanced was not enough to purchase all the rebar we needed, even for the first two houses we would reconstruct. Nevertheless, after a layover in Hong Kong, a half day’s flight to Kathmandu, a night in a hotel, a short plane ride to Phaplu, and a day and half’s trek, all 15 of us, plus our guides and trekking support staff, arrived in Chhulemu. Unforeseen event number two: rain. I’ve been to Nepal in late October-early November three separate times and, like the locals told me would be the case, there was no rain. I so advised my trekkers. 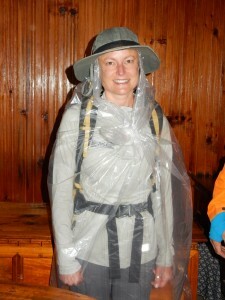 We walked through rain for half the time we trekked to Chhulemu. I failed to put rain gear on the packing list. Most had brought it nonetheless. For those who were unprepared we improvised and I ate humble pie. Reentry from any time away, especially for an extended period, is always difficult for me. It’s even more difficult when I come back from Nepal, and this time was no exception. For nearly two weeks I was away from phone calls, texting, emails, and the internet. The everyday thorns in my side had been removed when I boarded a plane in Denver and while I was gone I was able to concentrate on settling into an easier way of life and focus on the mission of HDF. The easy, rhythmic life of harvesting and drying beans and corn from ancient terraced fields is both idyllic and soothing to the soul. I loved the pace and the easy nature of the tea culture, one neighbor to another. Yes, I did enjoy hot showers and my own bed when I got home, but at the same time I longed for the Sherpa village emersion, both a place and a life I called home for more than a week. There is nothing like breathing in fresh, clean, and clear Himalayan air and beholding other worldly vistas. I’d love to share it with you. I’ll be going back in November, 2015, leading a group of volunteers. The plan is to help build the toilet facility for the Monastery in Taksindu and perform other volunteer work for what I call “monks-in-training”, those orphaned young boys who live and study there. We will have cultural discussions with the monks to learn about the Sherpa Buddhist way of life, and we will add on a trek to take in more of the beauty and splendor of this amazing slice of the world. If you are interested in going, please contact me. Finally, I’d like to make an appeal, asking you to make a tax deductible gift to Himalayan Development Foundation. Hopefully, you’ve enjoyed these posts and have come to a better understanding of what we do to improve lives in Nepal. Our Toilets in Taksindu can use your generosity. It costs HDF about $500 to purchase the materials which are not available locally, and to hire the carpenters to do the construction. Each homeowner is responsible for supplying all the rocks, sand, and lumber for construction. Additionally, that homeowner is also responsible for fifty percent of the labor in building the toilet facility. Not only will you be assisting in improving public health in Chhulemu, you will also be helping the farmers improve their agricultural methods, thereby working to pull them out of poverty and bringing the fathers and husbands home. To make an electronic gift, simply click here http://hdfoundation.net/?page_id=113 and click on the Donate button. If you would prefer to write a check, please make it payable to HDF and send it to me at 193B 2nd Ave, Lyons, CO 80540. Thanks so much for coming along on this trip with me. I’ve gotten a lot of pleasure out of sharing my experiences with you! We spent 8 days in Chhulemu “overseeing” construction of the first EcoSan composting toilet and it was a roaring success. Then Jay and I were led by Pasang back down to Phaplu for our return flight to Kathmandu. (Not Dolma’s baby Pasang, but the guide Pasang whose wedding I wrote about. Yes, there are many with the same name and it can get confusing, especially since they all have the same last name, Sherpa.) Our flight was scheduled to leave at 9:00 the morning after we arrived in town, but due to delays and cancellations we did not leave until midday on the nineteenth. That left us with only a few hours to explore Kathmandu and even though I’d been there a couple times before, I can’t seem to get my fill of this fascinating vibrant city. We made the most of our short time before our flight left the next day. After my 2009 Nepal trip, I sent a Nepali neck scarf to good friend, Christian Valentiner, in Oslo. Later, he happened to be at a concert in Norway where Nepalese blues guitar player, Ashesh Dangol was performing. After the performance, Christian introduced himself to Ashesh, told him about the scarf and passed the neckwear on to him. When he returned to Nepal, Ashesh hung the scarf on a ceremonial shrine in the Himalayas as a token of our three-way interconnection. In our one night in Kathmandu, Jay and I, along with Tim and Kathryn, two other newly-made American friends, saw a performance of the Ashesh Trio (Ashesh on lead guitar and vocals, plus a bass player, and a drummer) in a club in Kathmandu. And, what a performance it was! This guy played and sang his heart out in a way I’ve never before heard. Jay described it right, saying Ashesh “shredded that guitar”. He is a true musical genius. Before I left for Nepal I had sent him a message on Facebook about my visit and when I would be in Kathmandu. He responded and told me where he would be performing, and invited me to his studio beforehand. Because we were delayed in getting out of Phaplu, we could not make the studio visit, but we did sit through most of the amazing four and half hours they performed that night. During a break from a set, I introduced myself to him and he joined our table. I know, blues and Nepal don’t seem to go together and he confirmed that in addition to his band, there are only about three other blues artists in the country. When I asked him how he learned the music, he sheepishly shrugged and said he “picked it up”—self-taught in other words. He’d started playing the guitar when he was fifteen, but didn’t get serious about blues until his early twenties. Now, at thirty-eight, he is a master. Ashesh told us he is Newar, that tribe of people who have been the indigenous people of the Kathmandu valley since prehistoric times. He and his brother (formerly of the band, but who now lives in Australia) are the only musicians in the family, although there are a number of others in the arts, including writing and design. He and his band play a mixture of cover songs and many originals of his own creation. I bought copies of his two CDs, “Free Spirit” and “Free Spirit II”. His third album is due out within a couple months. To learn more, visit see his Facebook page, Ashesh Dangol; his website, www.nekhvam.com; or check him out on YouTube. I had a conversation with Dolma Sherpa on a warm sunny morning on a slate patio outside my host’s house. Dolma, whose smile is radiant and presence emits grace, sat on a metal chair with her younger child in her lap. Ngima, the local English teacher, interpreted for us. Dolma, 26, has been married to Nymgyal, 33, for 7 years. Together they have two children, a boy, Lhakpa, 5, and a girl, Pasang, 10 months. Both parents were born in Chhulemu and call it home. Dolma’s father is dead and her mother, plus Dolma’s 12 year old brother, live with the family. The couple cannot make enough money to live on by farming in the village, so during most of their marriage Nymgyal has worked in Malaysia gardening, sending home most of what he makes. He spends months at a time away from his family. Dolma tends the family farm and raises the children while Nymgyal is gone. In addition, she is the midwife for the village. She has an eighth grade education and is taking English classes at night. Unlike in previous generations where large families of 7-8 children has been the norm, she and Nymgyal feel their family is complete with their two. When I conducted the needs assessment meeting in Chhulemu in October, 2013, it was Dolma who first said they could use better toileting. That idea was agreed upon by the rest of the assembled group as the number one priority for the village. Dolma’s second priority was for the community to be taught better farming methods to improve crop quality and yield, and possibly to introduce new crops, all of which would allow them to sell crops on the open market. Again, the assembled agreed with her. Little Pasang had warmed to me during my stay and when she reached her arms out for me, I took her into my lap. This beautiful child smiled at me and played with my fingers while her mother and I spoke. I asked Dolma why better toileting had been at the top of her list a year ago. She told me that somehow she knew their current method was bad for their health and bad for the environment. She knew nothing about composting toilets and how they could address those concerns as well as better farming methods. When she attended the meeting conducted by a Nepali expert in the EcoSan toilet and she was excited to learn that urine alone can be used as both a pesticide and a fertilizer. After the EcoSan meeting, Dolma asked Jay and me if her family could be the next recipient of the new toilet, and if it could happen now. As I reported in an earlier post, before coming to Nepal we had decided to build only one unit this year, wait at least six months to see how it was received, then build more in 2015. Because Dolma had originated the toileting idea, and because she had already collected the sand and begun gathering rocks, we decided on the spot to grant her request. Construction will begin in December/January. She likes living in Chhulemu, but does not like being separated from her husband. Dolma’s wish for the future is to have the farm provide enough work and income for the couple, allowing them to raise their children together. We view Dolma as an up and coming leader in the community. (Currently, she is the secretary of the village’s women’s committee.) Through her presence and ideas, the village agreed upon the top two priorities HDF is and will be addressing for the foreseeable future. She told me she will be an advocate within the village to encourage all households to switch to the EcoSan toilet. HDF wants to support that advocacy by raising sufficient funds to make it happen. Post #9 An Eco Village? Dan Bhadur Basnet, a Nepali social worker with over 20 years’ experience has supervised the installation of more than 80 EcoSan toilets, and was onsite for a couple days overseeing construction. On the second day he gave a presentation to a group of Chhulemu families on the design, use, and maintenance of this new method of toileting. It all starts with the design of the squat style toilet receptacle. It has a diverter, so when the toilet is used correctly, the urine is separated from feces. Urine flows through a small hole, into a tube and then collected in a large drum outside the toilet facility. Solid waste passes through a larger hole, and with the application of a small amount of water, follows through a waste drain into a covered composting pit dug into the ground, also located outside the facility. Urine mixed with feces is unusable as compost, unless it is properly processed at a sanitary treatment facility. To have the villagers gain a preliminary familiarity with the EcoSan concept, Basnet devoted his remarks just to urine. It can be used both as a pesticide generally and as a fertilizer specifically for nitrogen loving plants. Repeating himself several times, he told the villagers that to gain maximum benefits they needed to be conscientious in using the toilet every time the need arises, and if they do, they will reap benefits through increased crop quality and yields. If they don’t, they will have wasted the time, money, and energy needed for the construction of their new toileting system. He stressed that not only is the EcoSan toilet better for the environment and the health of the local community, it is also a simple but very effective agricultural improvement tool. He will come back periodically over the next year or so to see how things are going, answer questions, and give any further necessary instructions. Toward the end of his presentation, Basnet talked of another benefit Chhulemu could look forward to receiving. If all twenty-eight households have EcoSan toilets installed, there is an “Eco Village” designation available from the government which brings with it special benefits all the villagers would enjoy. Yet to be explored are the nature of those benefits. After his presentation, Jay and I asked him about composting solid waste, which he did not mention in his talk. The video link at http://hdfoundation.net/?page_id=454 shows two chambers below the toilet receptacle. While one is filled, the other previously filled vault will act as a composting chamber to cook the feces. In Basnet’s model composting pits are used instead of the two vaults. A pit, dug by hand, is about nine feet in depth and approximately six feet in diameter. The bottom seven or so feet are layered with rock, leaving a floor of the pit at about two feet from the surface. The perimeter of this receptacle pit is lined with rock and finally, it is covered with boards, large flat rocks and dirt. In this method, the solid waste will stay in the top portion of the pit while the waste water finds its way down through the seven feet of rock before entering the soil. By the time it reaches that level, whatever contamination originally carried by the waste water has been filtered through the rock porosity and poses no danger to ground water. This pit receives solid waste for six months, a second identical pit is dug, and then used to receive the solid waste and water. The waste in the first pit cooks into compost over the next six months and at the end of that time, the compost is spread over crops. The first pit, now empty will be used as the receptacle while the second pit it being filled. These pits can be used over and over again for eight-ten years before the filtering rocks will need to be replaced. On subsequent visits to Chhulemu, Basnet will instruct the villagers on the use of the composting pits and spreading of the finished compost. Quite obviously, Basnet is a knowledgeable and very enthusiastic supporter of the EcoSan toilet. I understood barely a word he spoke, but he held the villagers captive as he spoke of the many advantages of the new toilet. He is one of them, know his stuff, and is an unapologetic, expert salesman. After hearing Basnet’s talk and seeing the reception by the villagers, I am evermore convinced Toilets in Taksindu project of HDF will forever improve the lives of those now living in the area, plus the lives of generations to come. This will be another “low cost, high impact” project. Right now, many husbands, sons, and brothers are having to leave the area in order to find work to provide for their families. Some work in Kathmandu, while others risk their lives overseas doing manual labor for little money in deplorable working conditions. The villagers see improved farming as a way to bring those men home by growing excess crops to sell on the open market, generating replacement income which is not now possible. The EcoSan composting toilet has the potential of making this dream a reality. There are no arranged marriages within the Sherpa culture, with men and women allowed to seek out partners on their own. Pasang met Yangdi, now twenty-three, at a festival celebration three years ago and it was instant attraction for both of them. They courted one another for six months and were then married. Yangdi lived with her family in a nearby village, less than an hour away. They didn’t date as we know it, but Pasang would go to visit and the two of them would talk and take walks together, getting to know each other. Soon they began discussing marriage, and shortly after that Pasang proposed to her during a cellphone call! She discussed it with her parents, who approved of Pasang, and he later asked them for their blessing, which they freely gave. During their courtship, they followed Sherpa tradition of having no physical contact between them, save for holding hands on occasion. Following this custom, they never hugged or kissed each other until their wedding night under cover of darkness. The bride wore a ceremonial white dress and hat and the groom wore a black gown and red hat. They were married at the Yangdi’s parents’ house in a traditional Buddhist ceremony, with a local monk officiating. Over three hundred guests were in attendance. A wedding celebration followed, including Sherpa dance, drinking rice beer, and eating plenty of dal baht, a favorite food of the Sherpa consisting of lentil soup, rice, and sides of an assortment of pickled vegetables, green beans, stewed greens, potatoes with herbs, hot peppers, and whatever else the cook chooses to add. To follow tradition the newlyweds would have spent the rest of the night alone in the bride’s parents’ house, but the revelry continued until morning, and they never had that time. The partying followed the next night with a second celebration at the groom’s house. This included more Sherpa dancing inside the home, plus the laying of scarves around the necks of the couple. The party then moved outside and lasted through the night with modern dancing to the sounds of boom box music, drinking rice beer, and eating of meat curry and dal baht. The true wedding night, with their first hugs and kisses, would have to wait until the third night following the ceremony. Sherpa love their tea, to the exclusion of just about every other drink, including plain water. For themselves, they serve it in a couple different ways—milk tea, or salt tea. Both are made with milk, raw milk straight from the cow that morning with no pasteurizing and no homogenizing. Milk goes into a pan that’s placed over the ever burning fire in the kitchen area, and with it simple black tea measured out with a lid that fits over the tea jar. Just before the milk boils, the brew is strained into a metal teapot. A very large quantity of sugar or salt is then added and mixed with a wooden stirrer that has an airplane propeller type end on it. Sherpa like their sugar and it’s mostly consumed in milk tea. I’ve speculated that such heavy consumption may be due to the “luxury” quality of the imported stuff, as no sugar product is grown locally. Then again, it may be due to the instant energy burst sugar provides. They burn an enormous number of calories each day and, for the most part are not overweight. Maybe they get away with consuming so much sugar because of the caloric burn phenomenon. The milk tea is what we would call chai, but without any spices; the salt tea is like nothing I’ve ever experienced before and don’t think I’ll try again. I’ve cut dairy out of my diet, and my hosts were most accommodating by brewing plain black tea (no sugar, please) for me. As in many cultures, tea serves as a social connection in the Sherpa community. Wherever we went in the village, we were invited to tea at different villagers’ homes time and again. It would be considered bad manners to decline, so we always accepted. Serving one cup is never enough, as that would be considered bad manners on the part of the host. Then the dance begins. It’s the Sherpa custom to refuse a refill from the host by placing your hand over the cup, pulling it away and saying “tu che, tu che” (no, no) many times over, and then if you really do want a refill to finally relent, allowing the host to pour into your cup. If you really don’t want a refill, a friendly argument begins and doesn’t stop until one side or the other relents. We drank so much tea that Jay and I developed a habit each morning of reporting the number of times each of us had to get out of bed and use the toilet during the night. Four times was normal for each of us and I assured him, against his suspicions and to his great relief, it had nothing to do with the aging process in becoming an old man, but had everything to do with the tea. Most often nothing is served with the tea. On those occasions when food is offered, it will usually be boiled potatoes, or boiled eggs. It is the best they have to offer and I felt honored on those occasions when one or the other was provided. The potatoes were usually the small new variety and served with salt, ground coriander, and a hot ground pepper. The eggs were as fresh as possible, having been laid by the hen that day. Both were delicious. The distinct sound of metal against stone rang through the crisp morning air and it was a happy melody to our ears. Even though we could not see the carpenter’s hammer smacking the chisel which in turn chinked away unwanted chips of stone, we knew the sound meant work had begun on the construction of HDF’s first EcoSan composting toilet. Ngima was leading Jay and me to the site, the house of Tendi, wife Yandi, and their sons, Dowa and Sonam. They were the winners of the lottery that was held in Chhulemu a couple weeks ago to see who would get the first composting toilet. We took a few steps further down the stone path to the house and saw the hammer swinging and the chips flying. Broad smiles crept across our faces. A year ago the villagers told me their number one request of what HDF could do to improve their lives was better toileting. Our research led us to the EcoSan type of toilet (to learn more see http://hdfoundation.net/?page_id=454), as it has a simple design that turns human waste into compost to be applied to fields where crops are grown. Moreover, it has been deployed and used successfully in many developing worlds, Nepal included. We have decided to build this first one this year. If it is well received and works in the way it is intended, we will build more next year and in the years to come. Two carpenters experienced in constructing this type of toilet, and who are from a nearby area, were onsite beginning the building and teaching three local carpenters the EcoSan style. The teachers were doing the stone work to build the foundation and the locals were plying planes to rough-cut pine beams, smoothing them into usable lumber. We watched the progress in sheer delight. Foundation rock was being dug from a nearby hillside, loaded into baskets, brought to the site, and dumped into the base of the structure. One of the workmen was using the traditional bamboo basket that is strapped to the head and used to carry large loads. He left the basket strapped to his forehead, crouched down, grabbed rocks, and tossed them over his head into the basket. The two woodworkers were fashioning the beams into a structure for the building’s doorframe with traditionally cut mortise and tenon joints. They use no power tools, as there is no power, save for that coming from lean muscles. Having delivered us to the site, Ngima left us in the care of Pasang, Tendi’s brother. Jay grabbed the last empty basket and jumped into the work of hauling rocks being dug by Pasang. I asked Pasang for something I could use to haul rocks and he told me I should rest for the morning. He was concerned about the old guy hurting himself, I guess. I became one of those workmen present at every construction site who stands around and watches everyone else do the labor. Late morning came and with it a tea break. All the workmen, plus Jay and I, gathered in the top floor kitchen next to the open fire. Yandi served us tea, plus plates full of boiled new potatoes. Plates of dipping hot sauce came next, creating a tasty Sherpa delicacy. With that, our host added plates of dendo, a hot wheat dough paste which is eaten by pulling off a hunk and popping in the mouth. Finally, Yandi served up bowls of a vegetable curry with a thin broth. Pasang warned us it would be very spicy and he was spot on right. Little Sonam and a neighbor girl sat on the floor eating the vegetables of the curry with their hands and slurping the broth straight from the bowl. In fact we all did, as it is custom. Earlier, I’d tried without success, to get Sonam to speak in English to me. Intuitively I knew he could. His mother encouraged him to answer my questions, What is your name and How old are you? but he refused to cooperate. When he drained the last of the curry broth, he yelled in English, “Water! Water! Water!” The adults broke out in long, sustained belly laughs. He and the little girl came over to me and again I whispered the questions, What is your name, and How old are you? This time he whispered the answers in my ear in perfect English. I did the same with his friend and she whisper-giggled out her English replies to me and both of them laughed long kid laughs. We slept in tents on the monastery grounds and ate last night’s dinner and this morning’s breakfast in a dining tent the staff had set up for us. Another charity based in Colorado, Bridges Between, sponsors a school in Ringmu and Chhulemu, the primary purpose of which is to teach English to illiterate adults, and children attending the local public schools. Five representatives of BB were onsite for part of the time we were there. They joined us for dinner last night and breakfast this morning. This is the monastery where last year HDF installed skylights in the dormitories of the orphanage run by the monks. This year we’ve agreed to pay for the building of a multi-stall toilet facility for use when there are large gatherings, such as a festival, or funeral. Before coming on this trek, I prepared an agreement between HDF and the monastery spelling out the terms of what we had negotiated. Karma had translated it into Nepalese and copies in that language and in English were signed this morning by the Head Lama and me. He and I also had a discussion about the needs to be fulfilled with the construction of the toilets. Jay and I have a much better understanding as to those needs and will be able to update the design that a Boulder based architect created for us. By late morning it was time to make the short thirty minute trek down the side of the mountain to the village of Chhulemu where Jay and I will be spending most of the rest of our time. This town, consisting of about twenty-eight subsistence farms, each with its own farm house, is just off the main trekking trail and is the home town of Karma, Phurwa, and Ngima. The three of them, plus others in the nine sibling family own the family home in the village. Brother, Dowa, and sisters, Lhaki, and Yangdi farm the land and live in the home year round. None of them are married. The folks from BB have been sleeping in tents that are set up just outside the family house and the six of us join them. The support crew of our trek joined forces with the staff of BB’s trek and together, the ten or more of them cook and provide other support needs for us. Each morning at the designated time established the night before a guide greeted us in our tents to provide cups of freshly brewed tea. That was then followed a bit later with bowls of hot water to use in cleaning up for the day. After arriving in Chhulemu, many of us wandered the village, taking in the sights and meeting new and, for Jay and me, old friends. That night the entire village, plus all of us, were invited to dinner at the family home, followed by boom box music and traditional dance. Not everyone came, but at least fifty locals, plus the eleven of us, crowded into the second floor room of the house. The evening started off with our eleven seated in a row on one side of the room. We were then blessed by several of the locals hanging silken scarves around our necks, along with handmade strings of marigolds. The scarves are meant to honor and bless a person for safe travels. The necklaces of marigolds are just a simple “you are special” blessing for the recipient. Four women and four men dressed in colorful local costumes, teamed up to put on a line dance show for us, and we were not disappointed. Another group of young girls in differently styled costumes performed next. Finally, all of us were invited to get up and join them in a carefree, dance-as-you like session. Any party would not be complete without alcohol. The drink of choice is what’s known as Roksi, a pure grain homemade brew that I’m told tastes and feels something like Everclear in the US. They say it will get you where you want to go…in very short order. After breakfast and packing up to go, we walked down off the mountain and back onto the main trail. Like yesterday, the weather was perfect. It was cold enough when we had breakfast that I wore my down-filled jacket, stocking cap, and gloves. Those items came off before we started out and by the time we’d joined the main trail, I was down to a floppy hat, tee shirt, and shorts. White, puffy clouds dotted an otherwise clear blue sky. This trail mainly follows the river valleys north. Parts of it are relatively flat, with ups and downs along a steady upward ascent. Other parts can be quite steep and involve climbing over mountain passes and descending into another river valley. I’ve found I can handle any of it with relative ease, depending on the pace. For me that’s where the good part comes. I’m a relatively slow but steady walker, and since we are traveling as a group and it’s important to stay together, oftentimes I will set the pace. Being that this is the main artery trail, trains of loaded-down pack animals, mostly made up of mules, move northward with us. They are carrying goods to various destinations, which support the trekking industry and local economies generally. Empty trains of animals pass in the opposite direction, going back for more loads. Whichever way they were going, they always have the right of way and we stepped aside to let them pass. The trail follows the east side of the valley, and the west side provided us with a panorama of lush green forested mountainsides. The snowy peaks to the north that we saw yesterday were no longer visible. We were too deep in the valley to see them. Some distance north of Phaplu the trail passes through forest where a clan of monkeys live and I was looking forward to seeing them again. Unfortunately, we had bypassed it by taking the monastery detour. “Monkeys?” you ask. Yes, monkeys. Nepal is on the same latitude as central Florida. We reached Ringmu just prior to noontime where we stopped for lunch. 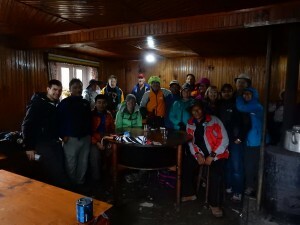 Again the guides prepared food for us and we ate on tables and benches in an outdoor eating area. Following lunch we ascended our first mountain pass, the Taksindu pass. It was a long, slow, very uphill climb and at the top was a Buddhist Stupa, along with an arch which we passed through. Prayer flags fluttered in the breeze and on the other side of the arch we were greeted with what has to be one of the most stunning vistas along the trail. We were high enough that we could see a long range of snowcapped peaks, too beautiful to be real. It stretched from our near left to the highest peaks on the far right. The mountain tops are so high they create an almost other-worldly view. We stopped in awe, mouths agape. It was a short descent into Taksindu, where another monastery is our next stop. Sending out posts for my blog did not go as planned. I had some computer issues on the first couple travel days, followed by not being able to send out posts once I left Kathmandu for the village. The first was unexpected, but not the latter. In any event, I did write and even though I’m now back home, I’ll be sending out what I wrote at the time. It’s November 6, 10:30 PM Nepal time and I’m writing this from a Kathmandu hotel room where Jay and I landed three hours ago after forty-one hours of traveling since we left Denver. I don’t know how many time zones we’ve passed through, but thanks to an eighteen hour layover and plenty of sleep in Doha, Qatar, we’ve pretty well beaten the west-to-east jetlag thing. We will be picked up by Phurwa Sherpa tomorrow morning at 5:00 AM. The van then will stop to pick up four other trekkers, Jesse, John, Celia, and Ilse from their hotel and then all of us, plus our gear, will head to the airport. At 7:00 AM we’ll take a short flight to Phaplu where our trek begins. I’m excited. I look forward to breathing the fresh mountain air of the Himalayas, those mountains that explode with mystic majesty. I’m anticipating the home cooked meals of fresh vegetables prepared in traditional Sherpa dishes that delight the senses. And, of course I’m eager to meet old friends and forge new relationships with people I’ve yet to meet. For HDF this will be a new beginning as we build our first composting toilet. It goes without saying I look forward to representing many of you as we do good by improving the quality of lives for some of Asia’s poorest. Most likely, I’ll be away from the Internet while I’m in Chhulemu, so it may be a while before I’m able to post again. Since I last used this blog list, I’ve added some people and I hope you enjoy these posts. If you, or anyone else for that matter, prefers not to receive these emails, just let me know and I’ll be happy to remove your name. Certainly, no hard feelings. and Starbucks, but that’s where the chain influence stops. With no Wal-Mart, McDonald’s, Subway, or any of such ilks, the local economy thrives exclusively on colorful, locally owned and operated mom and pop inns, restaurants, and shops. The quality of food to eat and goods to purchase is unsurpassed. 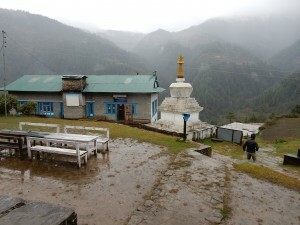 Because it is the stop-off place for thousands of trekkers heading for higher elevations, on a daily basis it hosts visitors from all over the world. In chatting up a barista at the Illy shop, I learned that she spoke five different languages, using them all on a regular basis. In a Lilliputian version of Manhattan there is as much, if not more international diversity in this Himalayan mountain destination. The elevation at Kathmandu is 4,600 feet and to get acclimatized most trekkers will spend at least one night in Lukla, elevation 9,400 feet, before ascending higher elevations. Since many trekkers have that extra time, Lukla is a place where they stock up on forgotten provisions, hire guides and porters, exchange tales, and obtain expert advice on what may lie ahead. If those trekkers are sick or injured, there is a first rate hospital providing needed services. And, there is the airport, truly a lifeline to the rest of the world, providing regular and emergency fixed wing and helicopter transport. start of a journey of a lifetime and the jubilance at the successful conclusion of end of such a trip. A few steps away from that main house is a long motel like structure with a center hallway off of which are multiple bedrooms and common bathrooms with western style toilets at each end. I recognize I’ve made many sideways comments about toileting. I have read that the squatting method facilitates elimination, and I give that commentary it’s due. Squatting takes getting used to, and I’m not there yet. On the morning of Day 51 Ngima and I set out to see the sites. The sun’s blaze was brilliant late October warmth and the air was clean sweetness. We sauntered down the main street, heading north, away from the guesthouse and airport, taking in the morning hubbub. Every kind of serious gear for camping, trekking, technical climbing as well as trinket souvenirs can be found. Neither in Kathmandu, here, nor anywhere else I have visited in Nepal do the merchants pester potential customers. They display their goods in open-air stalls, on sidewalks, behind open doorways, or hanging from storefront awnings. If you show interest they will engage you and that can be the start of haggling, or not if you clearly show or say that you are only looking. I appreciate that respect, as it makes for a much more enjoyable experience. We walked all the way out of town to an arch over the trail heading north, a spot that marks the beginning and ending of treks leading toward and back from Everest. We greeted a group of weary hikers and using their cameras I snapped group pictures for them as they embraced each other and celebrated their victory. They had planned on hiking to Everest base camp, but did not make it, for want of waist deep snow. When it became apparent they would be heading into even bigger trouble, they heeded the advice of their Sherpa guide and holed up in a teahouse for several days until they could get out and safely make their way back to Lukla. In this case their victory was not in making it to base camp, but in having an adventure they’d not planned on and being lucky enough to survive and tell about it to their grandchildren someday. On our return trip through town we encountered a couple of packs of water buffalo trains beginning their trips north. While there is nothing unusual about a team of water buffalo making their way through downtown Lukla, there is everything about it that speaks of being in a land apart. I’ve seen it before and I pinched myself again for having witnessed it again. The largest flat tract of land in all of Nepal! because it meant a full day of rest in Lukla before the return flight, and so that’s what we did. Moreover, the longer this trek lasts, the more certain I am that I do better going uphill than down. Yes, it’s more strenuous—I breathe harder, and my heart beats faster climbing up, but the downhill stuff was getting really hard on my knees and it’s much easier to slip and fall. It was a tough climb and we got our adrenaline rush as we approached the end of the runway of the Tenzing-Hillary Airport where the trail ends. continued along this main trail to what’s now Everest Base Camp and from there, made their successful climb to the top of the world. On day 48 we walked out of Nunthala toward Kharikhola in an early morning light rain. Ngima had purchased extra umbrellas and gave one to me. That was a good option in this warmer weather. The rain gear I brought kept the rain out, but its waterproof quality had the effect of bathing me in my own perspiration. So, without the umbrella, I would have been better off and more comfortable not wearing the rain gear. Hard to really see, but this is what a muddy trail looks like. The rain stopped within an hour, but it had been another night of non-stop drizzle, keeping the trail slick and dangerous. Over these two days I learned from other trekkers that the rain had been caused by a typhoon off the coast of India. That storm had spawned a massive weather pattern dumping heavy precipitation over all of India, Nepal, and other nearby Asian countries. We got rain in the lower elevations, while trekkers higher up were met with blizzard conditions. I have complained about the unwelcome nature of this unseasonable weather, but my inconvenience has been nothing compared to the stories I’m hearing. Many trekkers could not reach their destinations in what quickly became waist deep snow and had to turn back. They were lucky, as others higher up were trapped and died. Just as in the Colorado Rockies even in August, hiking at high elevations is always fraught with the possibility of deadly unexpected snow, high winds, and lightning. Local basket weaver at work. Day 48 was to have included visits to two other schools off the main trail. Given what had happened on Day 47, I politely declined the honor of visiting those schools. The main trail was slick enough and I did not need the added difficulty of lightly used trails. I was disappointed and I know Ngima was, too. I’m pleased to report I did not fall a single time in these two days. I’d put away my poles, as they were of little help and got in the way. So how did I do it? Well, I’m not embarrassed to tell you that Ngima and Jetta placed themselves on either side of me and held onto my arms in the most difficult parts. At the end of these days I quipped that I must be getting better at trekking in mud, as I’d not fallen once. Don gets to hold another newborn. Starting in Ringmu and at virtually every stop, whether it was for the night, or a tea or lunch break the following was repeated time and time again. The host of the place where we stopped would be tipped off by Ngima as to whom I was and spontaneous to me that host would approach me and drape a satin scarf around my neck thanking me in Sherpa language for the skylights that HDF had installed in the local school. It was very heart warming, and on each occasion I accepted the honor in the name of all the donors, including you who have made gifts to HDF. Part of the luxury suite at Hotel Four Seasons Payan. Fabulous dessert served on fine china. brought room service dinner to me, including hot apple pie drizzled with cherry syrup. With no roads or rail, how are goods supplied, both for the needs of the trekking industry and the locals? The answer is they come in on the backs of animals and porters. Say you are a hotel and you need bottled gas for your propane-fired shower, or you are a local and you need fifty pounds of rice that’s grown at lower elevations. Both will not come from Amazon.com, rather from suppliers in Kathmandu. Virtually everything not grown or made locally comes from Kathmandu. Morning and mule drivers loading up for the day. To place an order, the innkeeper or the local would call it in to a hub distributor located in a larger village, say Nunthala, Lukla, or Namche. The hub distributor collects several orders, combines them and places one larger order to various suppliers of items such as building materials, fuel, house wares, clothes, and foodstuff. The goods will be brought in to Sallerie (far to the south on the main trekking route) on truck and either warehoused or made ready for delivery. A single driver of a pack of 10-12 mules will load up his team with all the goods that are to be delivered to a hub distributor and take off. Most destinations will be more than a day away, meaning at the end of the day the driver will lead his pack to a stable area outside of town, unload the animals, feed them, eat some dinner himself, and bed down for the night. No question who has the right of way. The next day he will load up the team once more and take off for his destination. The animals have minds of their own and love to exhibit their free will by straying off the trail into the forest either for a rest, to nibble on some grass, or just because. The driver is constantly having to yell, whistle, chase after, round up, throw rocks at, and brandish a stick on the hind end of one or more unruly beasts. When a trekker encounters a team is, guess what? You best step aside and wait as it passes, as clearly, the team has the right of way. The first one, two, or three in line will be wearing colorful embroidered patches on their foreheads and maybe even some flowers, signifying their leadership roles. When the driver reaches his destination, he will unload, turn his team around, and head back to Sallerie for another order. At first, driving a team of mules appears romantic. The mules are outfitted in elaborate saddles to which all manner of goods are strapped on. The animals wear bells that constantly clang a chorus of pleasant sounds. In addition to the embroidered patches and flowers, some will wear tassels attached to their harnesses. They are colorful and they are the Wells Fargo wagons of a hundred years ago delivering pots and pans, flour, kerosene, and candy bars; and it’s that driver who has charge of it all. But, I’ve got to tell you, without looking too long or too closely, it’s really a different story. It’s a hard life of very hard work. If the order is to be delivered north of Namche, say to Gokio Ri, Everest Base Camp, or Tengboche the order is unloaded from the mules and put on the backs of yaks for the rest of the route. The mules do not do well at those higher elevations and the yaks do. Another leader wearing tassels and flowers. A porter’s midmorning nap time. Daytime rain stopped a couple days ago, but nightly showers continue. For reasons I’m not sure I completely understand, Ngima decided we needed to leave Chhulemu a day or two earlier than what was originally mapped out on my itinerary. And, I’ve learned to trust my Sherpa guides. We packed all our gear, said goodbye to our gracious hosts and headed out for our next destination. Nunthala is an easy 30-45 minute walk from Chhulemu, but it turned out to be a day of complete and utter frustration and near disaster. On our way to Nunthala we detoured to Deku to visit a school where HDF skylights had been installed. That detour followed a lightly used trail, one that was slick with clay type mud; mud formed from all the rain we’d been having. Not only that, but the rocks were slippery, too. And, I fell…several times. I had no injuries, but the spills were unnerving. Walking along a ridge, we approached a small bridge that span a gushing stream that ran from my right. To get to the bridge, we had to cross a broad smooth rock that sloped down and to the left toward a waterfall and roaring white water. I took my time, attempting to plant my right boot high on the rock’s upper right end before I took my next step. No matter. As soon as I lifted my left foot, my right gave way and I was belly down, sliding at lightning speed toward the waterfall and depths below. From behind Ngima and Jetta quickly grabbed me to stop my fall as they pinned me to the rock. I was completely okay with that, as it was preferred to what was otherwise next. I was not the only one who fell that day, but nobody fell as much as I did. After we checked into a hotel and had our morning tea, we headed out for a visit to another skylight school in nearby Chhaga. Lhakpa stayed behind to continue his recovery from his hives episode. A woman who worked in the teahouse where we had tea accompanied Ngima, Jetta, and me. She was a good friend of Ngima, and when school is in session, she teaches at the Chhaga school. Just like the trail to and then out of Deku, this one to Chhaga was narrow and slick with mud. To make matters worse, this trail had a treacherous incline—both up and down. And, just like the trail to Deku, I slipped and fell, and fell, and fell again and again. After a half dozen spills and whenever we came to a particularly muddy part, Ngima and Jetta would grab my upper arms to keep me from falling. I felt no wounded pride. I was just grateful to stay upright and avoid a potential broken bone, sprain, or worse. After about an hour’s walk, the four of us arrived at the top of a hill and took a pause. Ngima pointed over a ridge to our right, and there in the distance several hundred feet below was the village of Chhaga. I closed my eyes and let out a sigh of despair. “Ngima, I’m not going any farther. I’m sorry, but the prospect of going the extra distance, all down a very steep hill is just not in the cards.” This had been the first time I said no. I got no argument, just understanding. Ngima handed something to Jetta who then took off down the hill. I didn’t know it before, but Ngima has a cousin who lives in Chhaga and he had bought some tea to give him. Jetta was off to make the delivery. I apologized and offered to stay while the rest of them made the trip down and back up. “No, it’s all right,” he said. While we waited for Jetta to return, the three of us sat and munched on snacks they had brought along. I felt a small sense of defeat, but I knew in my gut I’d done the right thing, and that gave me an even greater sense of relief. To everyone’s great relief, Lhakpa’s headache was gone; he was out of bed and eating. He said he was feeling better than the day before, but still had hives covering many areas of his body. Plans for the medevac were shelved and temporary credit was given to the incantations of the “witch doctors”. With the help of Ngima and Lhakpa, I conducted a “needs assessment” with a representative group of the villagers. I wanted to hear from them what they thought the village needed to make it a better place to live, something that the Himalayan Development Foundation could help with. So often Western assistance to developing countries comes from assumptions and a place of “this is what we think you need”, rather than simply asking and trusting they know best for themselves. Of course there is always the situation that they won’t know about options until they are exposed to them. This was the situation with the stoves project. My board and I recognized we had not asked the villagers about whether they would like a more efficient stove to cook on. We also recognized they probably never thought twice about their current method and were completely unaware of a much better alternative that might be available. In the end we determined it would be better to purchase and demonstrate an inexpensive stove than to take nothing in at all. If, after witnessing the alternative they decided they wanted nothing to do with it, we would have made an “eyes open” effort with little downside risk. More about the stove project later in this post—now, it’s back to the needs assessment meeting. Of the twenty-thirty families in the village, five people showed up—four women and one man, ranging in age from twenty-five to fifty-three. While I’d hoped for more, I was not disappointed in the turnout. A vast majority of the villagers are illiterate (another Colorado based charity is working on that) and from the self-imposed shame of that, they believe they have nothing worthwhile to say. Therefore, they will never come to a meeting like this. Moreover, because everybody farms and it was harvest time, many needed to be in the fields and couldn’t show up. Finally, many of the men were out of town working on trekking assignments, or were in other countries trying to make a living. Ngima told me later that the ones who attended were well respected in the village. This method of conducting a meeting, the purpose of which is to solicit everyone’s opinions, is very empowering. People who might not otherwise share for fear of being interrupted, challenged, or ridiculed are suddenly the single voice in the meeting. Further, it has the tendency to cause everyone else to actively listen to what’s being said, rather than planning a rebuttal. It would not be fair to the other members of my board of directors to disclose here the details of the ideas that came out of that meeting before we have a chance to first discuss them. But the broad range of topics included improved farming methods, sanitation issues, instruction in the school, and a possible business collective opportunity. Fan stove on left, open three rock fire on the right. About the stoves. Ngima and his family cooked on the new stove at every meal for the entire time we were in Chhulemu…while also using the three-rock open fire. I was disappointed and asked him why. He acknowledged the efficiency of the stove and the dramatic reduction in smoke it produced when compared with the open fire, but said the burner wasn’t big enough. There is one large cooking pot used in nearly every meal and its bottom has a greater diameter than the burner. Nevertheless, he wanted to make a complete transition from the traditional method to a “fan stove”. He committed (a) to either finding, or having fabricated a “fan stove” with the larger burner; (b) installing it within an adobe countertop; (c) having it properly vented to the outside; and (d) completely eliminating the three-rock fire. He also said he was sure that once he did this in his family home the entire village would follow by example. I told him to let me know when he’d done (a)—(d) and HDF would relook at its possible involvement in the future. For a week now, Lhakpa has suffered from a rash that started with minor itching in places where his clothes rubbed his skin. When he told me about it I gave him Benadryl that I had. At first he said it helped and so I gave him the entire three-four days’ supply. While it may have given him temporary relief, the condition has gotten worse, not better, and hives have formed, spreading to several areas of his body. Moreover, this morning he developed a severe headache and stayed in bed all day. It had been his plan to go to the clinic in Nunthala when we arrived in the area, but with the month long festival in full swing, the clinic has closed and there were no doctors available. The entire medical staff had gone to be with their respective families in distant locations. His next approach was to seek the help of three separate local “witch doctors”. (Why three? I’m guessing he wanted a second, then a third opinion.) He told each of them that it all started after he washed his hair at the beginning of our trip to Jiri. Each one of them told him that the washing of his hair had somehow triggered a cast of evil characters to follow him, and as long as they continued following him he would suffer from the rash. They each said an incantation to chase the rascals away. While he didn’t discount the diagnoses and treatments, he told me he was skeptical. Yesterday Ngima consulted with brothers, Karma and Phurwa (Lhakpa’s father) and the three of them concluded Lhakpa should walk to the hospital in Lukla today. There was no way he could walk even to nearby Nunthala today, let alone all the way to Lukla. So, once again the brothers consulted by phone today and determined that if he weren’t better by tomorrow, they would call in a helicopter to medevac him to Kathmandu. Lhakpa’s condition had us all deeply concerned. Ngima’s brother, Dawa, teaches me how to churn butter. stove, we having decided that locating it in the home of the village elders would be another good selling point. In a matter of minutes, the fan was attached, wires were strung, an impressive hot fire was burning, and lunch was cooked using the stove. Just before we arrived in Chhulemu, it started to rain and it continued through the night and all the next day. I’m told this is unusual, as most rain falls during the monsoon season of July through mid to late September. Nevertheless, it hampered our plans to visit people in the village, as the trails were too muddy and slippery. Instead, my hosts planned and then through a party in my honor, inviting villagers for dinner and dancing. (Apparently, it was not too muddy for villagers to come in our direction.) Ngima told me they wanted to gather to thank me for the skylights in the town’s school. Students with scarf they had signed for delivery back to Eichelberger School in Illinois. About thirty people—men, women, and children—showed up. We had a traditional meal of Dhal Bhat—rice with a lentil soup, and potatoes. Lhakpa thanked me on behalf of the community and all applauded. One by one several villagers approached me and placed a satin scarf around my neck, and then one each around the necks of Ngima and Lhakpa. Then, the dancing began. Led by Lheki, women lined up arm in arm, sang a traditional folk song and performed a line dance that went with it. A few men joined, but it was mostly a women’s show. That was then followed by boom box music to which nearly everyone got up and danced and danced in a free form style until the party began to fold near midnight. * No matter that it was a Monday, the Sherpas love a celebration. For me it was gratifying to be honored and for once I was the tallest person in the room. Student practicing her English by reading a letter from Eichelberger student in Illinois. The cultural exchange of the hand made pictures and letters from my grandgirls’ classes did not come off quite as envisioned. My time in Kathmandu researching and finding a suitable stove caused me to arrive in Chhulemu later than our itinerary suggested. Back-to-back Hindu festivals occur this time of year, causing the schools to close for about a month. By the time we arrived in Chhulemu, the school had just closed and the faculty had left town. Instead of conducting the picture and letter giving at school, we specially invited students to come to the party and the gifting was made there. I’m told those who took letters and pictures will return their own to me before I leave. Others will follow in the mail once school resumes. Skylight panels for two other schools. backs of mules and porters. 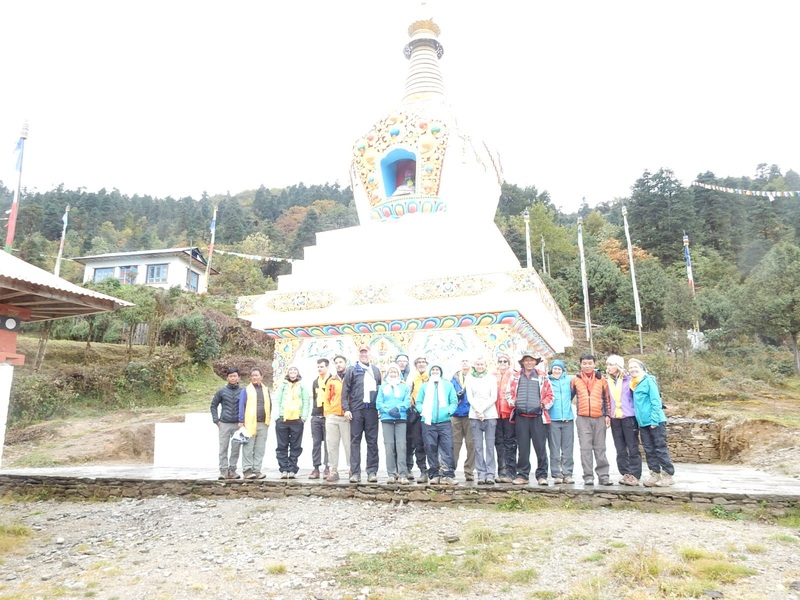 The panels for the Taksindu monastery were part of a larger delivery that included two schools in the general area. This three-facility bundle of panels was delivered to Taksindu by a mule train. From there the panels for the two schools were delivered on the back of a porter, ten panels at a time. When I asked him, Jetta told me each set of ten weighed about 50-55 kilos—110-120 lbs. The backpack I’ve been carrying weighs 30-35 lbs. I have enormous respect for porters and the work they do. I thanked this one profusely. The Taksindu monastery operates an “orphanage” for boys and it is in their dormitory rooms where skylights were installed on this day. These are not boys whose parents are both dead, but boys whose families are so poor they can no longer afford to care for them. The boys are well provided for in the monastery, where they go to school, and live as “apprentice” monks. The rooms of the dormitory are dark and cramped, with three and four boys to a room originally built for two. It will be necessary to take out a section of the ceilings in each room to build a shaft from the roof for the light to shine through. Part of our involvement provides for that. To ease the cramping, the larger project for the monastery is to take an old building and convert it into a kitchen with dining hall on the first floor and to make living space for the boys in the previously unused gabled upstairs. Skylights were installed in that area to create livable quarters. The monastery’s Head Lama and another elderly monk (who I believe to be the Head Lama Emeritus) joined us for dinner on Friday night at the guesthouse where we were staying. The next day the bunch of us watched as the carpenters installed the skylights in both the current dormitory and the building being converted. I can’t begin to tell you the absolute joy I felt as I witnessed the installation! In Ringmu I’d seen the end result, and now in Taksindu I actually saw the work being done. Wow! Installation of skylights in the existing dormitory. Head Lama’s study for tea. Sherpas do not normally eat a breakfast meal; usually waiting instead until about 10:00 to have a bowl of richly spiced noodles. Plus the tea, we were given a delicious bowl of freshly made soup, all served in ceremony by young monks. The Head Lama then draped a beautiful yellow colored scarf with an intricate design around my neck followed by a similar presentation to Ngima. He gave his heartfelt thanks for the skylights saying the scarves were given as a token of his appreciation. I accepted the honor and told him that I was just a representative of many people who had made gifts of money to make the project happen. It’s no joke nor is it hyperbole to tell you I had tears in my eyes as I accepted the honor of his gift*. We moved into their kitchen area where Ngima and Jetta set up one of the stoves for the Head Lama and the Head Lama Emeritus to use as their own. The stove is made of heavy fabricated metal and, as I’ve said before its efficient design creates more heat using less wood and creating less smoke. What makes this possible is a small fan mounted on the end of an intake tube. The fan blows air into a chamber that surrounds the firebox, with the air then being dispersed into the firebox through a series of small holes. That constant stream of air oxygenates the blaze, creating a much hotter fire than by the traditional method. In addition to the other benefits, food is prepared in less time. Stove, with air intake on left, wood cradle in front and fan sitting on burner on top, which is screwed into the opening of air intake. reason, it was not an option here four years ago. Now most, if not all, the homes and businesses (along with the monastery) have electricity—just enough for minimal lighting. The fan for the stove is designed to be run on DC current, but is furnished with a small AC plug adaptor. If the power goes out, the fan can be attached to a battery as a backup source of power. Gleeful lamas over their new stove!! installation, and if it worked to his satisfaction I asked that he please tell the villagers. He said he would gladly do both. I figure if the stove does indeed prove to be a successful alternative, who better to advocate that? *Many, many thanks to all of you who gave so generously to this project. Without your support, this would not have happened. Period! Thank you, thank you, thank you!! “Before” picture of new dormitory area. “After” picture of new dormitory area. The final day of our trek into Taksindu began at 8:00 instead of the usual 7:00. This alone told me that Ngima was right, that it would be an easier day. It began with more of a steady uphill climb, but soon leveled off into a route following the contours of the mountainside. Like everyday before it, this one provided some of the most breathtaking scenery the earth has to offer. The snowy peaks were to come before long and, in the meantime, waterfalls crashed over rock ledges thirty feet in the air, and vistas of lush, ancient forests in pristine condition presented themselves in every direction. It occurred to me over and over these past five days that the only way to see the view from the top of the mountain is to climb there. Ngima had told me that the destination would reveal itself “just around that corner”, motioning to yet another a bend in the trail. And, as so often has happened, while I’m expecting to see what’s predicted, when it arrived I was taken off guard. We did finally round that corner and there laid out before us was the broad valley carrying the main trekking trail more than a mile away on the other side of the roaring river far below. That trail leads north to Lukla, Namche, Gokio Ri, Everest Base Camp and other sought-after Himalayan destinations. At the south end lay Phaplu and Sallerie. The airstrip of the Phaplu airport under reconstruction was plainly visible, as was the extent of the commercial district of the twin towns lining the road to the south. Following the path north, a trail I’d been on four years ago, I could pick out the spot of the monkey forest, just around the bend. Then tracking the ribbon further north I could make out a porter with his line of pack animals carrying loads to distant destinations. The road passed through Ringmu where it then wound up, into the forest reaching Taksindu Pass marked by a clearly visible white Buddhist stupa. Jaw dropping awesome—there is no other way to describe what stretched out before me from one end to the other. Not surprising, a teahouse had found this spot and we stopped for our morning break. I could have stayed there all day, just taking in the endless raw beauty the vista from this spot provided, but we moved on taking the trail as it hugged the mountainside on a gentle downward slope. Traveling further north and down toward the river, Paplu faded to the right and Ringmu came into sharper focus and as it did, I could make out the red roof of the elementary school. Keeping my eye on it, I strained to see if indeed the skylights had been installed as reported. And, yes, there they were, gleaming in the sunlight! I had no doubt, really, but to actually see them in the roof of the building warmed my heart. In the four years’ time since Jay and I hatched the idea of putting skylights in schools to provide a more hospitable space for learning, there was my first glimpse of HDF’s finished work. There was the finished product of the donated gifts of so many, some of you. What a sight! Thanks to all who made this happen. The trail continued on down, crossing tributaries before the final major river of the valley. Then it was an upward climb to Ringmu. Following lunch we made the final push over the Taksindu pass to the village of Taksindu itself. We stopped here to watch the installation of skylights in the monastery and to rest for a day before making the final short walk to Chhulemu. To say I felt like we’d arrived home is not quite right. I’d stayed in the teahouse where we landed and the owner greeted me warmly as we shared stories of four years ago. And, I’d attended a ceremony in the Buddhist temple across the road, so there was a sense of familiarity to this place. And, after the five hardest consecutive days of hiking I’ve ever experienced**, feeling home comes close enough as I fell into a deep sleep in my sleeping bag under the heft and warmth of a comforter. *This was all captured on video—one of those I’ve not yet been able to find…yet. **Without being slowed down by foreigners, the locals make the trip in an easy 2 days. Once more Ngima told me this would be another tough, long day. And once again, he was right, and so we were on the trail at 7:00. We continued a relentless hike up the path through heavy woods that followed the spine of a mountain ridge. On three separate occasions we came to signs indicating we were at a pass, with a trail leading left and downward; and on each occasion Nigma motioned us on up the trail to a still higher pass. At the second pass we could see the soaring snow covered, craggy peaks that make up part of the majesty of the high Himalayas to the north, yet we were still too low to see Mt. Everest. Late morning we came out of the forest at about 10,000 feet and from there we could see in the distance a scattering of buildings nestled in the saddle of the pass. By 1:00 we’d made it and stopped for lunch at a restaurant being run by a young woman. I was sitting outside enjoying the gentle breeze and the warmth of the early afternoon sun when I first noticed a baby was sleeping on a nearby bench sheltered under an open umbrella. While Mom was inside fixing our lunches I sat next to the waking infant, letting her clutch my finger. She started to fuss, I picked her up and that was all she needed to settle herself as her wide-eyed gaze took in this strange man holding her. With a prideful smile, Mom told us her sweet little girl was 22 days old! Until lunch was ready, Ngima and I took turns holding and rocking this precious, unexpected bundle of new life near the tree line elevation of over 10,000 feet. How could you script this? After lunch at about 2:30 we began a long descent through a thick forest down to Junbesi. An hour later we came upon a boy, about ten, and his sister, about eight singing their way up the mountain trail, carrying three traditional handmade brooms. In a brief conversation with them Ngima and Lhakpa learned they’d been down to Junbesi on an errand to buy the brooms for their mother and they were now on their way back up the trail to home. It took us until 6:00 to make the rest of the way to Junbesi. To a couple of local kids their combined trip of down and back up had been a simple childhood errand. Here and one other place the hot shower offered was a bucket of water heated over the fire. While dowsing my head with a pail of water is not quite the same as a constant spray of hot water over my body, I welcomed the soothing warmth. I put on clean clothes and snuggled into my sleeping bag under the extra layer of a comforter. Lhakpa took pity on me by bringing dinner to my room. Sometimes even “very basic hotels” provide extraordinary service. We were on the trail again at 7:00 and Ngima told me it would be a long day. He was right. By the time I collapsed on my bed at the hotel in Sette, it was 5:30. My feet hurt, my knees ached, my shoulders were in pain, and well, I just ached all over. It was another grueling day that found us making an even steeper ascent than the days before, over a 9,000+ feet mountain pass, followed by a long and just as steep descent, then back up with a final ascent to Sette. No rain fell on us, but until midafternoon, the sun was beastly. At about 2:30 cloud cover rolled in providing some welcome relief. We kept pace with a young American couple, Brian and Ally, who have been living and working in Malaysia for the past couple years. This was their second trip to Nepal in 2013, having done a major trek in the spring. They love the country so much that they decided to come back again, this time following a route that would take them to Everest Base Camp. They had started out in Jiri, too and I was curious how they were doing and how they were finding this trail. I felt some comfort when they told me they were struggling as well, that it was much more difficult than what they had experienced on their spring trip. The places where I stay are commonly known as hotels, guesthouses, lodges, or teahouses. All are good nouns that give you a general idea of what they’re intended to be, as long as you put the adjective “basic” before the noun and “very” before “basic”. I’m not being critical, not at all. It’s what you get when you find yourself in the Himalayan Mountains where there is very little electricity, no running hot water, and cooking is done over an open wood fire with little or no exhaust to the outside. There is running water, albeit cold. The mountains provide springs everywhere and those are tapped with flexible pipes that are then run into interior spaces, primarily the kitchen and the toilet rooms. Some hotels will have showers with hot water provided by a propane burner. I always have my own private room that has two single beds, each consisting of a wooden platform and a 3-4 inch foam pad for a mattress where I lay out my sleeping bag. A pillow is also provided. Of course the rooms are unheated, so if needed, the host will offer me a heavy comforter to go over my sleeping bag. The floors are made of wood, as are the dividing walls between rooms. Are the guesthouses clean? Yes, they are, but not by Western standards, nor could you expect them to be given what I’ve just described. They provide basic shelter and that’s really all that’s needed for travel like this. I’ll tell you about the food in a later post. …cute kids along the way. We left at 7:00, with Ngima telling me we had a longer day ahead of us and it would be good to get an early start, beating some of the heat of the day. Long days are long days, but this one had an extra twist of drizzling rain in the afternoon. My green day pack vs Jetta’s basket day pack. The morning was a long, long, steady and steep uphill climb. It wasn’t until about 10:30 when we emerged from the forest that Ngima pointed out a mountain pass some distance away. For most of the rest of the ascent we could see our midrange destination and just beyond, gathering dirty clouds. As we got closer, billowing gray fog seeped over the rise in our path ahead. By the time we reached the pass the fog was thick enough to obscure from sight a group of monks no more than thirty feet away as they leaving their monastery and walking up the ridge. Ngima took me into the kitchen of the restaurant where we had lunch. Two fires were burning, one in the traditional method of cooking and the other in a type of stove we had purchased. The intensity of the heat with minimal wood produced by the efficient variety was dramatic when compared to the traditional fire. Through Ngima I learned that she preferred using it compared to the traditional one. Our descent into Bandar that afternoon was a treacherous hike through drizzling rain. (Locals don’t wear ponchos or rain gear; they carry umbrellas. It works perfectly well, but seeing bobbing umbrellas up and down on the trail seems awkwardly British in one of the few countries they never invaded.) The path was steep and the rocks were slippery. Add my growing weariness to that and the result was slipping and falling four or five times, the last of which had me landing on all fours in a rivulet of water. Hiking sticks are not full proof. I was not hurt any of the times, but I was more than glad when we reached our guesthouse in Bandar at 3:30. Last night the lodge where we stayed in Jiri was pelted with ceaseless heavy rain, so much so I was convinced that if it continued today we would not be able to leave for Chhulemu. Even if it didn’t continue raining, it had poured so hard and for so long that I could see nothing but trekking in the mud through washed out trails. But I was wrong. The rain had stopped before breakfast, and while there was some mud on the trail, it wasn’t bad. In fact, it was a beautiful day for a hike and we were on our way by 7:30. Now get this: Karma is the brother of Phurwa and Ngima, lives in Boulder, CO, and is my Sherpa friend with whom I worked to make all these Nepali arrangements. He had just called Ngima to check on our progress and from halfway around the world directed the speed of our travel! Talk about a support team. We did indeed slow our pace. It was a hot day and I did not complain. Jetta with his heavy load. walked a bit further to a spot where that river joined a much larger one. We then crossed the larger river on another suspension bridge and entered the town of Shivalaya where lunch was served and where we stayed for the night. It was noon when we arrived. Nepal is on the same latitude as central Florida, which explains the temperate climate in most of the country. It also explains why I heard the continuing “weieieieie” chorus of a multitude of unseen tree frogs today and why I saw two small lizards on the trail. Further, it explains the appearance of the monkey at the monastery in Kathmandu as well as monkeys still further along. They also take formal training in guiding and then they are tested before they are licensed as guides by their country. While you are in the hands of a Sherpa guide, you are in the hands of an expert and you are well cared for. Moreover, they are among the gentlest, gracious, kindest, most humble people I’ve ever had the pleasure of knowing. Whether their nature comes from their culture or their Buddhism is impossible to know, as they are so intertwined. Their people skills are most impressive, making them easy to like. They have great senses of humor and I thoroughly enjoy being in their company. A couple more things: Every Sherpa’s last name is Sherpa, and Sherpas have limited the number of first names to seven, one for each day of the week. Whether you are a boy or girl, the name of the day of the week on which you were born will be your first name. It sounds confusing to me, but they assure me it’s been working fine for centuries. Oh, and some do have nicknames. I’m in Jiri, right now, that place in not-so-eastern Nepal where the road ends. This town is only about 110 miles from Kathmandu, but it took over seven hours by car to get here. That speaks to the conditions of the roads and the intense traffic. My guides and porter, plus our gear and driver made the harrowing trip in his Toyota Corolla. I also experienced my first ever stop at a military style checkpoint. In fact, there were eight of them, all done by unarmed National Police in this democratic republic. My guides said they were routine, an effort by the government to stop illegal trafficking of contraband coming in from China, but I’m not so sure. We were a long, long way from China and traveling toward it, not coming from it. When Lhakpa (I’ve been spelling his name wrong) asked me if we had them in the U.S. he seemed surprised by my answer, a firm no. On two of the stops, I was singled out from among the five of us and asked to enter personal data about myself (i.e. name, age, nationality, passport number, etc.) on a roster that seemed to be reserved for people who didn’t look Nepalese. There were no Nepalese registered, but just about every other nationality you could imagine were represented. My first experiences of racial profiling and I didn’t like it. And, I’m not letting it rain on my parade. We bought a second stove at a shop here that fabricates them. It’s basically the same design, but has a couple different features. Now we’ll have two to test and let the villagers choose from, and if this works out we have a source much closer to the village than Kathmandu. I got my haircut in Kathmandu the other day and as I sat in the chair I decided I’d get my first ever shave by a barber, not having any idea what it would cost. I got a great haircut, the best shave ever, and a fantastic scalp massage as well. The total came to 200 Rupees. That may seem like a lot of money, except when the exchange rate is factored in—it’s about 98 Rupees for every dollar—say 100 to 1. The haircut, shave and massage came to a total of about $2.00! I gave the barber a generous tip. The exchange rate makes the pricing for the stoves just as astonishing. I paid 2700 Rupees for the first one and 2500 for the second one. Throw in the cost of portering the appliances into the village and we’re still under 30 bucks per stove. This has the potential to be another low cost, high impact project, and I’m liking that. Sorry for the absence of pictures. I’m having computer trouble which I hope to fix before the next post. As I explained in an earlier post, when I visited Nepal four years ago, fellow trekker, Jay, and I spent a week doing some service work in Chhulemu, the hometown of our Sherpa guide, Phurwa. When we returned home, we formed a nonprofit 501(c)(3) charitable corporation, Himalayan Development Foundation (hdfoundation.net) the purpose of which is to provide needed assistance in the area. Friend, Linda, joined our board and over the past three years we have concentrated on what we call our Skylights for Schools project. Chhulemu is a village located in the Taksindu District (think county) of the Solu Khumbu region (think Mt. Everest) of Nepal. You won’t be able to find Chhulemu if you do a Google map search, but you will be able to find nearby village of Taksindu. There is no or minimal electricity in the Taksindu District and each of the classrooms in the local elementary schools are dark, as they have only one small window. Moreover the classrooms can be chilly, as they are unheated. There are no ceilings in most classrooms, with the exposed corrugated metal roof being what separates the classroom interior from the outside. If you take out a panel of corrugated metal and install a panel of corrugated translucent fiberglass, you have a skylight creating a lighted classroom and bringing in some radiant heat. We are now in the final stages of providing skylights for fourteen schools and the local monastery. I’m leaving tomorrow, Oct 6, on a trip to Chhulemu to visit friends I made in my previous visit and to see the results of the skylights project. (I’ll be riding a bus for eight hours to the end of the road, and then it’s a four-day hike to the village.) Since some of the work is now ongoing, I’ll get to be a part of an installation. The villagers cook on an indoor traditional three rock open fire, a method that’s been in use for centuries. This inefficient technique emits smoke and pollutants into the air that residents then breathe and from which they contract diseases that kill. Open fires also mean that wood has to be collected to burn. On behalf of HDF, I will be conducting a demonstration project while I’m in Chhulemu, introducing a much more efficient cooking stove intended to replace the open fire method. I’ve purchased a fabricated stove that creates heat faster, uses less fuel and emits far less pollutants. We (I’ll be led and accompanied by three Sherpa guides, Neema, Lacpa, and Jetta) will carry the stove with us and set it up in one of the homes in the village. Once installed villagers will be invited to come watch a meal being prepared on the stove. If there is interest among the other villagers, it is HDF’s intent to take next steps to make stoves available to them. And, if it catches on in Chhulemu like the Skylights for Schools project did, we see other nearby villages wanting to make the change. This project has the potential to dramatically impact lives and the environment in many ways, including improved health, reduced problematic deforestation now going on, and time saved collecting wood—time better spent doing other things. While I’ll be gone, I’ll have virtually no Internet connection, so this may be the last of my posts until I return to Kathmandu on October 23. I promise to pick up the story then. In the meantime, try your best to get along without me. I’d forgotten what it’s like riding with myriad others in our individual freewheeling tilt-a-whirl cars spinning on moonscape roads dodging an assortment of bumper cars and motorcycles in the Asian version of daily demolition derby. I was here four years ago, so I thought I’d be prepared for the traffic and accompanying swirling mass of humanity. Not so much. I’m glad I’m riding and Neema is driving. He, Phurwa (my guide from four years ago), and Lacpa, Phurwa’s son, met me at the airport and drove me to Neema’s apartment where I will stay until Neema, Lacpa, and I head to Chhulemu. Yes, they have them here. No, I did not take a ride. There are more motorcycles than cars and more potholes than both combined. There can’t possibly be any dust in the mountains, because it’s all here in the air, everywhere. The only traffic light I’ve seen so far was a blinking red one at a major intersection, where a cop stood in a center island doing a bad impression of a cop directing traffic. There are no lines drawn on the road indicating traffic lanes, simply because there are no traffic lanes. The only lines you’ll see are the pedestrian zebra stripes. Why they’re there I haven’t a clue, because walkers and drivers alike ignore them. People walk in the streets because there are no sidewalks, or maybe it’s that cars and motorcycles drive on sidewalks because there are no streets. Hard to tell. Pedestrians always have the right of way—never, unless of course they can outrun the motorcycles. Since there is no centerline, heavier traffic going in one direction naturally takes up more than half the roadway. No need for a map to find your way around because even though the streets may have names, there are no street signs. A Popular Way of Caring a Heavy Load. This capital city of Nepal has a population of 2.6 million people and the metropolitan area billows to 5.5 million in a country of 22 million. Yes, it is a third world metropolis in which the infrastructure has not been able to keep pace with a population explosion that’s been going on for the past few decades. It’s not just the streets that need attention. I’ve been here three nights now and we’ve had our third unannounced blackout where electricity goes out for reasons no one seems to know and stays out for several hours before it comes back on for reasons no one seems to know. Nepal is the second poorest country in Asia (Afghanistan being the first) and has a diverse and tolerant population of Hindus, Buddhists, Muslims, and Christians. On our way from the airport we drove through a Hindu neighborhood where sacred cows freely wander. I saw one saunter over to an outdoor vegetable stand and help herself to a head of lettuce. The river we passed over is a cesspool of slime and filth, and the air pollution is so thick I still blew black gunk from my nostrils after I removed the mask I’d worn all day. Yes, freshly roasted corn on the cob! And, I love it! I really do. I don’t want to live here, but it is a vibrant, colorful, exciting place to be and I would recommend it to anyone seeking a bit of urban adventure. Sign flags wave in the streets announcing all variety of shops, hotels, repair places, trekking companies, adventure travel guides, tailors, teahouses, and restaurants. The place is alive with smells of burning incense mixed with freshly prepared food, and sounds from the ever blatting of horns honking juxtaposed to soothing meditation melodies. And, then there are the people of all colors, sizes, ethnicities, and ages. There are school kids in their uniforms walking home from school, moms carrying sleeping babies in their arms, young men carrying heavy bundles on their backs, men shopkeepers minding their stores, and old women roasting corn on the cob in the street. Because Nepal is so poor and unemployment is so high, many young people leave to seek work in other countries. What to the traveler appears exotic, the natives know it is life lived on the edge. If Asian countries think their squat toilets are superior, then why haven’t they installed them on their commercial airliners?